The Microm HM 360 Microtome brings you fully automated, heavy duty and consistent sectioning for paraffin embedded tissues, hard specimens, plastic sectioning and more. This automated microtome features a toggleable specimen retraction, as well as a moveable operating panel that can be swapped to either the left of the right side of the instrument for comfort. This rotary micotome is an ideal choice for applications in laboratories and hospitals as it maintains reproducible precision during sectioning. The Microm HM 360 Microtome is simple to operate with a touchpad keyboard that lets you select thickness, 1 of 4 operation modes and speed. This microtome can operate at single, interval, multi and continuous stroke and gives you a section thickness range of between 0.25 to 60 microns, with a vertical stroke of 64 mm. 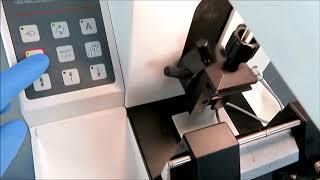 The Microm HM 360 microtome also allows users to make fine adjustments to trimming from 5 to 500 micrometers. This Microm HM 360 Automated Rotary Microtome has been thoroughly inspected and is performing to expectations. All of our lab equipmpent comes backed with our standard warranty. Should you have any questions please don't hesitate to contact us.